Perkville is a fun way to earn points for purchasing your bicycles and accessories, referring friends, and posting about us on social media! When you make a purchase at Spin City Cycles, you will receive an invitation to sign-up or you can visit their website. Be sure to use the SAME email address you used when you purchased in our store! Perkville integrates directly with our system, so each time you make a purchase, you will automatically earn points. Perkville sends you an email inviting you to track your points online (you can set up your notification settings if you'd prefer to receive fewer emails). Once you earn enough points, you can redeem them for money off in the shop. Perkville is a trusted partner of Spin City Cycles and will never share or use your information. Create an account at Perkville.com. Make sure to use the same email account that you signed up with at our shop. You'll earn 250 points just for joining! You also get points for referring friends and points for posting on social media. It's like printing your own money! 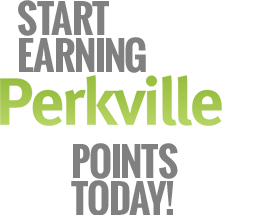 Log into your Perkville account to see your points - when you earn enough points - the option to redeem a perk will appear on your account. You'll choose your perk, print out the voucher, or just let us know at the time of your next purchase for redemption. It's that easy! Then, every 500 points you earn is worth $10.